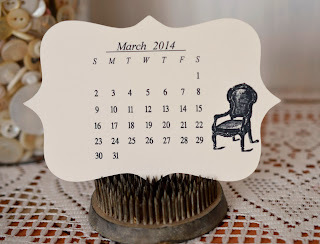 Lori Hairston: 2014 Calendars with The Cutting Cafe - WIN IT! Every year, Regina from The Cutting Cafe provides 2014 printable calendars in a variety of sizes. I often use them to make a calendar to keep in my office. Well, I had more than one idea this time and Regina is offering the 2014 Calendar Set, the Dress Shaped Card Set and the Framed Card set to one lucky winner! 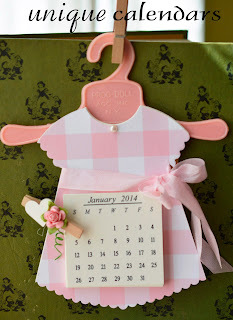 My first idea uses the Dress Shaped Card Set to create a holder for the small square calendar. (You can also see the Dress Banner I created a while back here.) I cut one layer from printed paper and two from 110# paper to make it very sturdy. 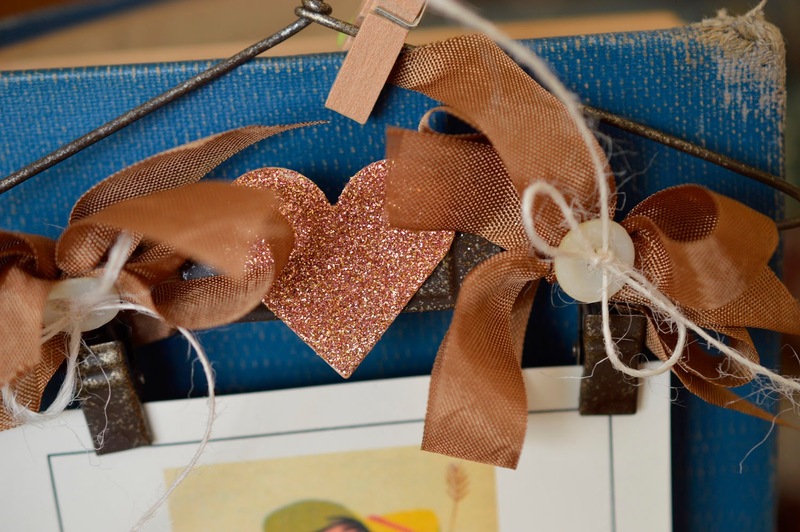 The dress is glued to a vintage doll's dress hanger. 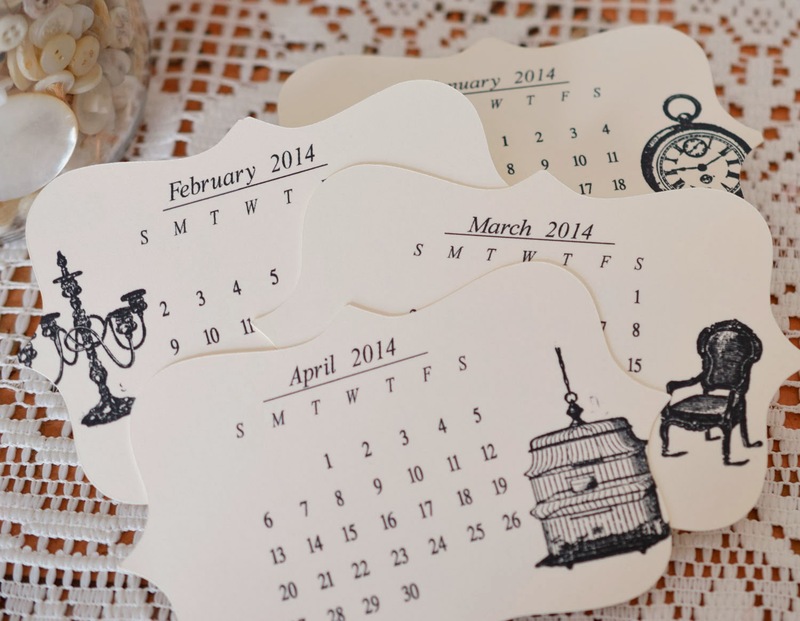 The calendar is also printed on 110# paper, cut and stacked, then attached by a decorated clothespin. 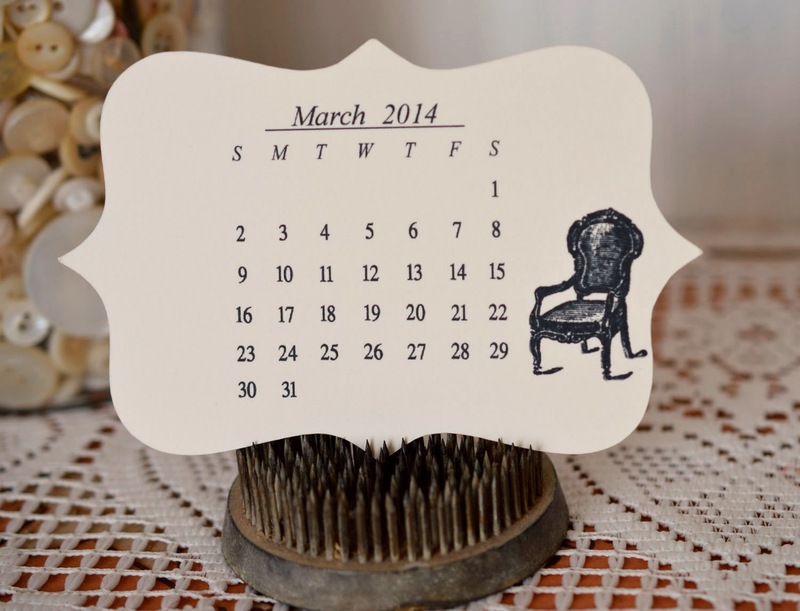 This will make it super easy to change out each month and to changed the entire calendar to 2015. Regina's calendar set makes it so easy to add an image. I had found this sweet vintage Meadow Gold calendar with drawings by Mary Blair. 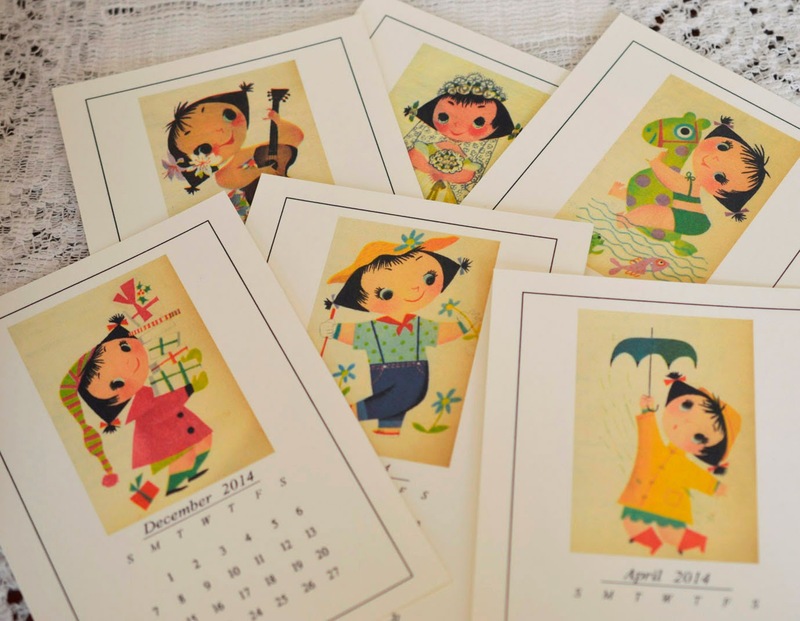 I added those to the square 2014 calendar and printed the set on 110# manila paper. I used a hanger to display this calendar, too! Here's a close up showing the glittered heart. The last calendar uses the Framed Card Set. I also stamped each frame shape with a vintage type image. Very simple to print and then cut the shape with the Cameo. I printed three months in the center of an 8 1/2 x 11 sheet of 110# cardstock. Then cut one frame shape on the Cameo to use as a guide. I layered the guide on top of the printed calendar and lined it up inside the cut. Then I just placed the two pieces back on the mat using the guide cut to line up where the printed calendar needed to be placed. I love old flower frogs so that was a perfect choice for me to display this calendar. Hope you are inspired to use the 2014 Calendar set from The Cutting Cafe to make your own unique calendars. If you would like to win the three sets, be sure to mention that you would like to win in your comment. So glad you came by - have a wonderful week! 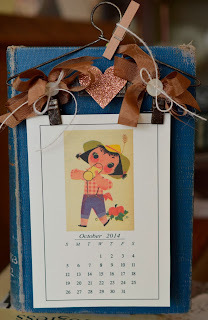 OH MY how totally fun.. i love those vintage calendars.. such a fun project.. thanks for sharing.. So talented. Love the calenders. oh my GOSH...this is really adorable and soooo CUTEEEEEEE love love all what you made...really great project...I LUV THIS..
Adorable projects. Makes me want to get going on my 2014 calendars. Thanks for the opportunity to win! 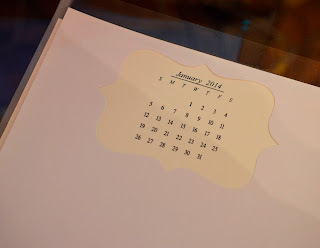 I was just thinking yesterday how I needed to find a printable 2014 calendar for some of my projects. What a wonderful surprise to open my email from you today with exactly what I needed! I would LOVE to win all three of these calendars. Thank you for your generosity and sharing your creativity with us. Adorable my friend. Loving the vintage images you used. 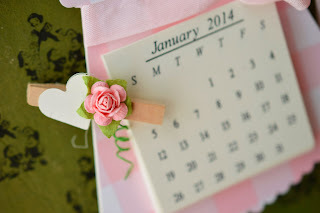 Hope you are having a happy Monday..
Fabulous Calendar Lori, love the design. I saw it on MIM. Wonderful! I can't decide which is my favorite! I didn't know Regina had calendars, so I'm totally excited about this! 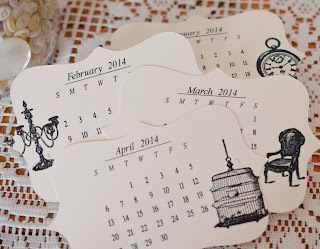 Love these calenders--such great ideas--would love a chance to win--Thanks!!!! !